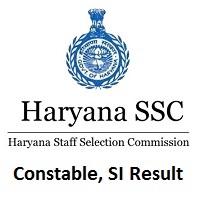 Haryana Police Constable Result 2019: Good News for Hopefuls eagerly waiting for the HSSC Sub Inspector Result. The Haryana Police Constable Result is released. Accordingly, The Candidates can check their Results for their required post from the Links given below in this post. Moreover, the clear details for the Male/ Female (GD) Results are clearly given in the link format at the bottom of the page. Also, you can get the Haryana Police Constable Cut Off Marks and HSSC Constable Merit List from the official website which is provided in this article. After the Written Examination, the qualified candidates should take the Physical Screening Test. As per the notice, the Physical Screening Test is scheduled on 9, 10, 12, and 16th of February 2019. Similarly, you can also get the Physical Screening Test Admit Card 2019 from the Official website which will be released on 5th February 2019. After qualifying in the written test, you can follow these. Also, Check for those Written Test Results in our website along with the Cut Off Marks and Merit List Information provided in the below sections of the post. As known, Cut off Marks is the minimum marks to qualify in the HSSC Police Constable/ SI Written Test. As per the notice, HSSC Constable Cut Off Marks 2019 with category based details are given by the officials clearly in the official website. Those Candidates who can get more than their category wise cut off marks they all are qualified for a further selection process that is Physical Screening Test. Therefore, from below given table you can get details of the Cut Off Marks for both Male and Female separately. The Haryana Staff Selection Commission (HSSC) released the Merit List along with the Haryana Police Constable Result on the 2nd February 2019. The officials prepared the Merit List based on the cut off marks and the candidates who secured the highest score. So, cut off marks and merit are two barriers for an examination. Moreover, The Merit List consists of a list of candidates promoted for further rounds. Also, the detailed information can be taken from the Merit List pdf and download it from this post. Last, link details are given below for the both Male/ Female. Then you will find the Home Page of HSSC, search for HSSC Sub Inspector Result link. Next, Click on the link and fill the required details such as Registration Number, Password etc. Recheck for the correct details before submission. Then, you can see your Haryana Police Constable Result, HSSC Sub Inspector Result, Haryana Police Constable Cut Off Marks on the screen. Check the Result and take a printout of it for further use and also make some copies of it. Hope, you were happy with the information provided in this article. After downloading the HSSC Police Constable, SI Result, Merit list and Cut Off marks you can also, download for the Physical Screening test Admit Card 2019 on the 5th Of February 2019 from official website. Therefore, we will notify every update to you. Keep following our website regularly for such latest updates. Also, don’t forget to bookmark Freshers Now.